Fabulous Lake Muskoka Cottage & Boathouse~the perfect retreat! 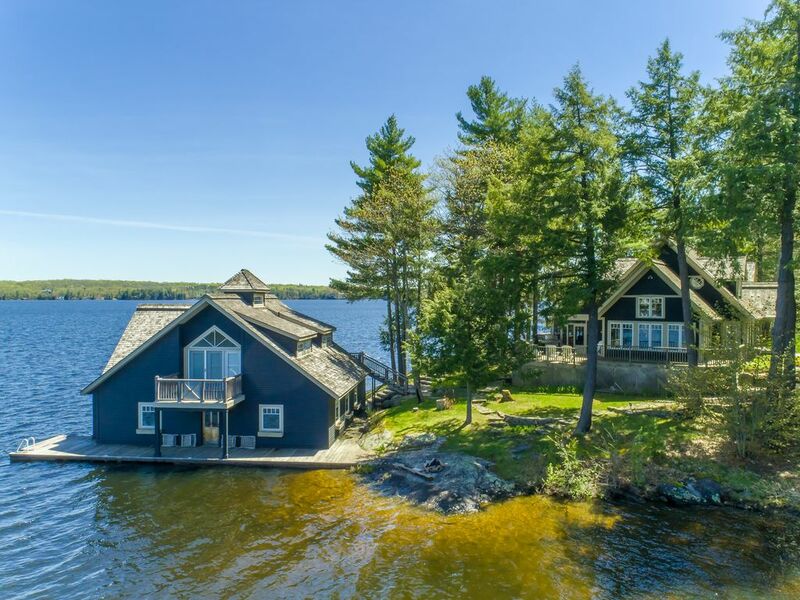 Located on coveted Acton Island, just 5 minutes from HWY 169 and connected to the mainland by a land bridge, this gorgeous recently built luxury cottage is just minutes from the shops and restaurants in Port Carling and Bala. With 4000 sq ft of space the main cottage plus a boathouse with accommodations, this cottage has everything you could need for a Muskoka family vacation. Featuring a two slip boathouse with an additional 650 feet of living space above, including a guest bedroom, kitchen & washroom. Elegantly furnished and well cared for since it was built, the grounds are brilliant with flowers and walking paths. The screened in Muskoka room has gorgeous views of Lake Muskoka. In the Great Room you will find a massive stone fireplace and comfy chairs for relaxing while reading a book. If movies are more your style, move on to the media room with its flat screen TV and satellite reception. The living and dining rooms are perfect for family gatherings. In the kitchen you will find high end appliances plus all of the tools one needs for prepping meals etc. There is also a hot tub just off the Muskoka room with terrific lake views. There are 4 bedrooms in the main cottage plus a total of 4 bathrooms. We also have central air and a generator in the event of a blackout. The cottage gets all day sun from sunrise to sunset and because it’s located on a peninsula there are gentle breezes that keep it cooler on the hottest days and also keep the bugs at bay. Enjoy an evening dip in the lakeside hot tub. With approximately 4 acres on 580 feet of shoreline there is lots of room for children to run around and play outside. We are north east facing but because of the angle of the point of land we get sun exposure from sunrise to sunset! Boathouse queen bed sleeps 2. Total capacity Sleeps 12 in summer and 10 in winter. Cottages sometimes don't live up to the photos, but this one absolutely does - it's beautiful, clean, well maintained and supplied. If you're looking for a comfortable cottage that has some luxury, this is it. We were there for a family long weekend and all members, from the 3 year old to the grandparents, had a great time. The only negatives, and they are so slight they're almost not worth mentioning, are that the blinds in the master were missing the remote to pull them up, the DVD in the kids bedroom was missing the cable that connects it to the TV, and the DVD in the TV room was nowhere to be found. Like I said, small issues that didn't really effect our stay, as evident by the 5 stars. We would love to come back and hope to! Lovely lake front cottage! Fun for all ages! My family and I spent a week on Acton Island at this lovely cottage. We all very much enjoyed our stay. Almost every room in this cottage has an amazing lake view! The boathouse and dock are beautiful. There are so many nice areas to relax and enjoy the scenery on this property. Muskoka District Rentals was so helpful - we highly recommend dealing with Maryrose to book your next family holiday. Located on the coveted Acton Island, minutes to Bala and Port Carling. This cottage is on a peninsula for the ultimate in privacy and gorgeous all day sun!